The first spin-off in the series was Kizuchida Quiz da Gen-san Da!, a quiz game released for the Game Boy on December 19, 1992 exclusively in Japan. Others were various Japan-only, pachinko machines, as well as home ports of them for Sony PlayStation, PlayStation 2, Windows-operated PCs and Game Boy. Outside of the franchise, Hammerin' Harry was represented in a Japan-only Game Boy title, Shuyaku Sentai Irem Fighter along with three other Irem franchises: R-Type, Ninja Spirit and Mr. Heli. 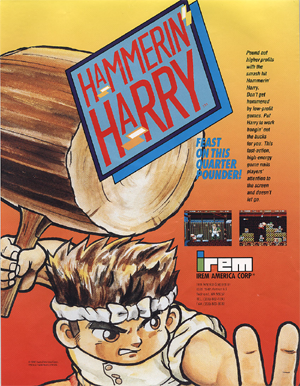 Hammerin' Harry can be seen on the arcade flyers of Ninja Baseball Bat Man, also by Irem. On March 24, 2008, an anime series based specifically on the PSP title Hammerin' Hero, titled as Ikuze! Gen-san, was aired on GyaO's website until June 9, 2008. There were 24, 9-minute webisodes aired. A DVD compiling the episodes was released in April 2009.do en 1984.